With her immense social media following, actress and influencer Anne Curtis knows how to handle trolls. With followers averaging 1 million per social media account, it's safe to say that Anne has mastered the “art of kebs” when it comes to nasty comments about her personal life. But when her newly-married bliss was targeted, the 32-year-old celebrity just had to speak up. 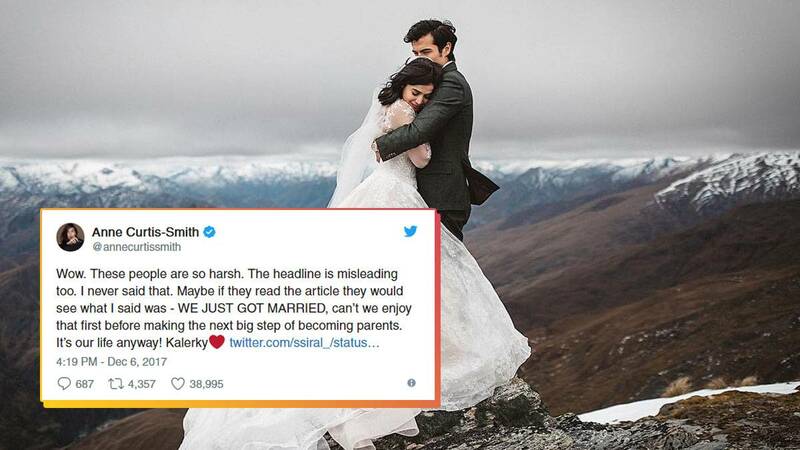 Anne retweeted a post from a netizen who first spoke out about the barrage of inappropriate comments left in the comment section of an Inquirer.net article titled "Anne Curtis no time to have a baby yet." In it, screenshots of various comments were included, targeting Anne in response to her supposed statement of not wanting to have a baby. Anne replied via Twitter: "Wow. These people are so harsh. The headline is misleading too. I never said that. Maybe if they read the article they would see what I said was—WE JUST GOT MARRIED, can’t we enjoy that first before making the next big step of becoming parents. It’s our life anyway! Kalerky." Anne tied the knot with entrepreneur Erwan Heusaff in a well-documented New Zealand wedding in November.